Michigan’s flu season typically peaks in February. And for those not yet vaccinated, there is still time. At Wayne State University, daily interaction with many people across campus is unavoidable. 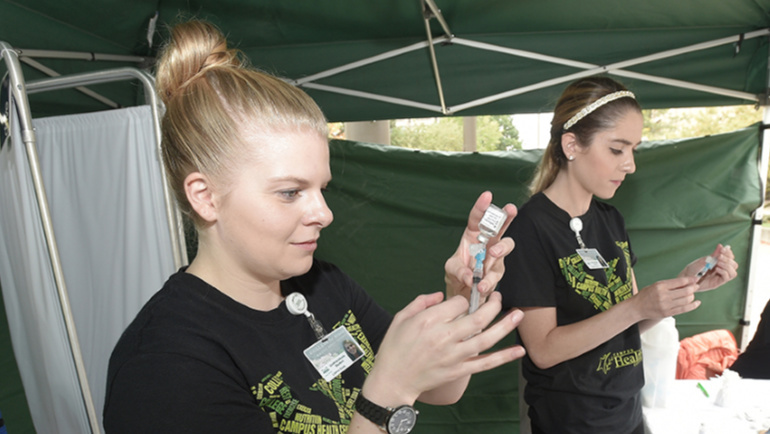 Immunizations help protect the campus community by preventing the spread of disease. The Campus Health Center (CHC) is providing flu shots to all Wayne State faculty, staff and students at walk-in flu clinics across campus and at the health center through the first week of March. Getting vaccinated against the flu is in accordance with the recommendations of the Centers for Disease Control and Prevention, and is for the health and safety of individuals, family members, colleagues and students. Flu shots are available at no out-of-pocket cost to all faculty and staff enrolled in a WSU-provided health care plan. For those not enrolled, there is a $35 charge for the immunization. CHC will process credit card payments or accept cash (exact change only) the day of immunization. Check CHC’s event calendar for the most up-to-date walk-in clinic dates. CHC offers some helpful tips for the day of your immunization: Bring one completed copy of the flu outreach consent form (paper copies are available at the clinic as well), bring your health insurance card (if you have one), bring your OneCard, and wear short sleeves or layers that can easily be removed. For the fifth consecutive year, Wayne State has won statewide and placed second in the nationwide College and University Flu Vaccination Challenge for medium schools. It is not too late to get vaccinated this flu season. Please visit one of CHC’s walk-in clinics to get your flu shot, if you haven’t done so already. For more information about the flu in Michigan, visit michigan.gov/flu.